Brittney Joy's Review ~ What a fun start to a new equestrian series! 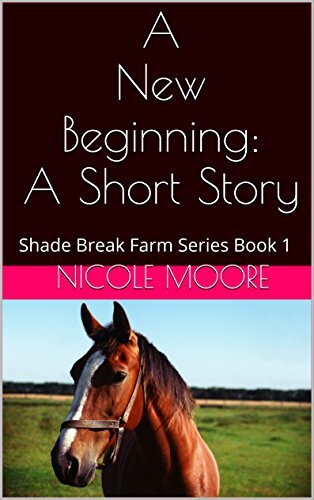 Nicole Moore's novella, A New Beginning, is just eleven chapters and a quick read which introduces readers to the characters of Shade Break Farm. I immediately fell in love with Flynn, the off-the-track Thoroughbred rescued from the kill pen, and Sarah, the fourteen-year-old horse-crazy girl who comes to live on the farm, to learn and to work. Both Sarah and Flynn have baggage - issues that were forced upon them, but they both seem to want to overcome their hurdles together (pun intended!). I'm a huge fan of an underdog story and I was rooting for both Sarah and Flynn from the second I met them on the page! This series seems like it will be a fun, feel-good ride! And it's obvious that Moore is an equestrian herself as the horse-terminology, descriptions, and equine personalities are spot on. I'm looking forward to seeing what the rest of the series brings!